Federal support will undoubtedly languish under Trump. But that’s OK, argues Noah Kirsch. What does the confirmation of new EPA head, Scott Pruitt, mean for the solar industry? Pruitt, considered a long-time ally of the fossil fuel industry, has promised to quickly withdraw the Clean Power Plan rule developed by the Obama administration in 2014. The CPP sought to reduce carbon emissions from the electricity sector by 32 percent from 2005 levels by 2030, and would have accelerated investment in renewables in multiple ways, including the Clean Energy Incentive Program and the option to price carbon emissions from the power sector. With the Clean Power Plan likely withdrawn this week and the prospects of a carbon tax or cap-and-trade unlikely, federal policy to accelerate renewables will lessen considerably. So is there any cause for panic in solar? I’d argue that there's not. And here are three reasons why. Second, certain state markets continue to offer solar-friendly renewable energy credits and tax breaks. Massachusetts, New Jersey and Washington, D.C. all have strong and stable SREC markets, with average prices between $0.25 - $0.50 per kilowatt-hour of energy produced. For context, the average commercial utility rate is $0.10. Other states like South Carolina, New York and Wisconsin have introduced hefty utility rebates, including Duke’s $1-per-watt rebate in the Palmetto State. As a solar financier, we are seeing building costs in the C&I space as low as $1.50 per watt on the low end, meaning that in some instances utility rebates can provide up to two-thirds of the system value as a rebate upon receiving permission to operate, in addition to available state and federal tax credits. Third, and most critically, are the relentless cost reductions the solar industry continues to make. At the end of 2016, solar panels dropped an unexpected 30 percent. Prices have dropped by nearly 60 percent in the last five years, driving a 119 percent growth in installations in the U.S.
Outside of the U.S., utility-scale plants are on track to generate some of the cheapest power ever produced. A PPA bid in Dubai recently went for $0.02 per kilowatt-hour -- a 150x net reduction in price since 1975. On the soft-cost side, the emergence of new project origination models are driving down customer acquisition costs, typically a considerable and stubborn portion of residential and C&I project costs. Financing is now cheap and readily available for residential and utility projects, while emerging players are finding innovative ways to expand access to capital into underserved segments of the market, like small-scale C&I. As a result, our internal estimates indicate that solar is at or near grid parity in five states, not including any federal or state subsidies. And 2022 will be an important year. That is the year when the federal tax benefits for solar will fully sunset, and solar will have to stand on its own two legs (not counting available state assistance, of course). This naturally leads to a crucial question: Will the industry enter a recession when the tax benefits expire? I would argue that the opposite is likely to occur. 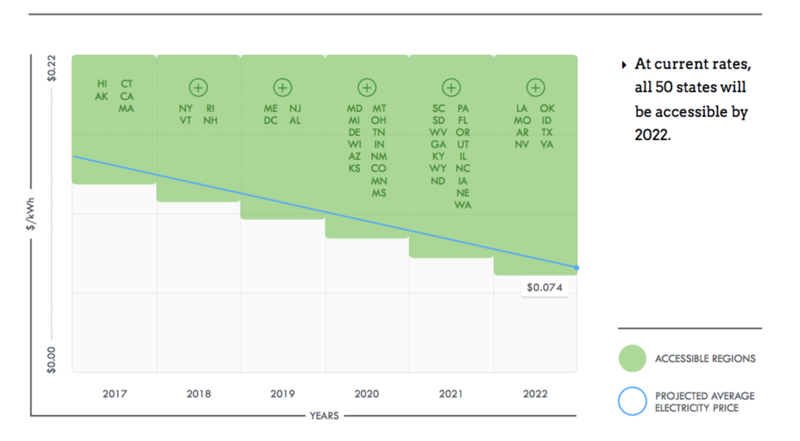 Using conservative predictions, the cost of solar is expected to fall 50 percent in the next five years, which we estimate will make all 50 states accessible for solar by 2022. The solar industry is likely to thrive in the next few years on the back of falling costs, supportive state policy, and the 2015 budget deal. While the federal government is unlikely to accelerate the adoption of solar for the foreseeable future, the industry will be more than OK.
Noah Kirsch is a director of finance at Wunder Capital. Press Release: 2/20/2017 Following the successful launch of its Term Loan product last spring, Wunder Capital has announced an expansion to the scope of project types that are eligible for financing.